Many of us have probably considered making a pipe by ourselves. And certainly that pipe should be something special, “the pipe of our dreams”. Some of us have even found a block and got started. The first discovery probably is that it is much more difficult than expected. You grind a little here and a little there and before even noticing, you have been grinding too much. When you at last consider yourself ready, the pipe will probably not look as you had anticipated, but perhaps that does not matter. It may look nice anyway and it is much easier to overlook some imperfections knowing that you have made the pipe entirely by yourself. If then the pipe does not taste very well, you will blame the wood. There are briar-blocks that may have an unpleasant taste, but they are rare, very rare. A more accurate explanation is that you have not drilled the block correctly. The interior of a pipe is extremely important. The diameter of all channels must be correct, the tobacco chamber must be formed in a proper way, the tenon must fit correctly, yes, there are a lot of details to think about. But how can you learn to make all these details correctly? 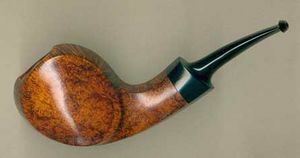 Many pipemakers have stated that the best way is to start with repairing. The late, famous pipemaker Sixten Ivarsson started his career this way. But a happy amateur cannot start repairing other people’s pipes, so he has to stick to his own. One advantage with this is that you do not have to stop by just replacing a broken tenon or putting a new stem on the pipe, you can also change the exterior of the pipe. If you find the shank a little too clumsy, make it a little thinner. And if the head is too chubby you can change that too. In that way you get experience and are developing your sense for proportions. 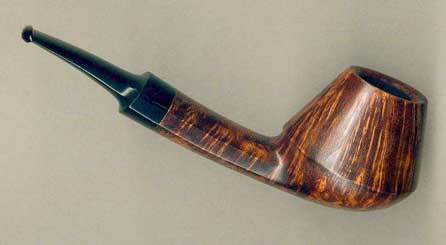 "Yesterday I altered the shape of an old Stanwell-pipe. I made it 8-pannelled and made the shank and bite a little thinner. It looks wonderful. Even my dear wife thought it was beautiful. Remains seeing if that impression lasts." The letter came from Bengt Carlson but at that time, I had no idea what this experiment and others would lead to. If I had known, I think my mind had boggled. I reminded Bengt about the letter and he remembered the pipe, but it is no longer in his possession. “I have probably sold it at one of our auctions”, was his comment. Bengt was also surprised that he had made 8 panels; he thought that seemed too “square”. From a nostalgic view it is a pity that Bengt no longer owns this pipe, because I think the altering of this specific pipe made him interested in making pipes of his own. Bengt knew that I was dabbling in this hobby and that I bought my blocks from Bo Nordh. It did not take long till Bengt paid this master a visit. So now I was no longer the only buyer of “cast-off blocks” from Bo, I had got competition. “Cast-off blocks” may sound second-hand and bad quality, but it is not quite like that. Bo buys sacks of blocks in the highest quality available. Then he is grinding all the blocks and keeps the ones he considers best suited for his pipes. The rest we may buy. But Bo has an extremely good reputation, so no one delivers anything but the very very best to him. That means that even the blocks he rejects are of such a high quality that similar blocks are hard to find anywhere else. Bengt became a frequent visitor to Bo Nordh and he really took notice of all good advice he got. I think that Bo and Bengt are similar in one way, they have an absolute feeling to make nothing but the perfect. I also think Bo quite early noticed Bengt’s great talent for pipemaking, which not the least was noticeable in his attitude. When I showed some pipes I had made to Bo, he was always overlooking and kind. He realised that I was a happy amateur and would never be anything else. With Bengt there was a difference - Bo was very critical, sometimes even ruthless. The explanation is, of course, that he noticed Bengt’s talent. But to make something first-class you must have suitable equipment. Bengt only had the ordinary tools most “do-it-yourself” people have in their cellars. So he had to invest in better machinery and first of all in a lathe. 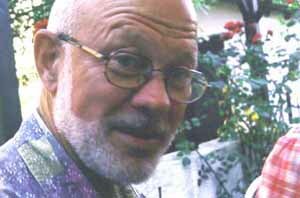 In 1998 Bengt got the possibility to retire, only 60 years old. This gave him more time for his hobby, something he had really longed for. Step by step Bengt built a well-functioning workshop and the rumour about his pipes was spread, above all in the U.S. Bengt got some influential customers over there and the word about his fine pipes got out. Suddenly his pipes were very much sought after. Nowadays Bengt has no problem in selling his pipes, there are always customers who want more than he can make. But in this aspect Bengt is exactly like Bo - he can not be stressed but works as he wants himself, the customers just have to wait. As a retiree he can afford this luxury. The production is about 25 pipes a year. 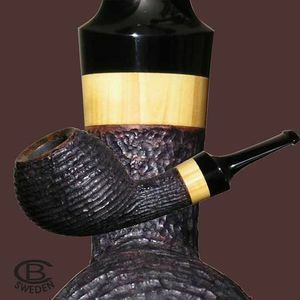 Bengt’s pipes are either plain or rusticated. So far he has not tried sandblasting. 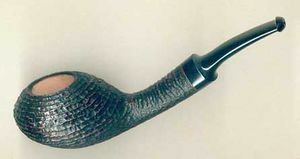 The rustication is made with a dentist’s drill and often looks like a sandblasted pipe with a ring-grain. The plain pipes are either nature-coloured (just oiled) or in a medium brown colour. Before they get their final colour, they are all stained with black, which is then grinded away. That is to make the grain more outstanding. All pipes are stamped “BC Sweden” and nothing else. Bengt has several times been asked to put more stamps on his pipes, the year the pipe was made, quality grading and so on, but has so far neglected to do so. The pressure has mainly come from the U.S. where a collector often wants many stamps on his pipe, the more the better. But I also think they respect individual pipemakers, like Bo Nordh and Bengt, who do not fall for this pressure. I actually do not have to ask Bengt about his favourite shape, I think I already know. And the answer is exactly what I had expected - the “ordinary Bun”, as Bengt is calling it. In the picture you can see an example of a “Bun”. This is also the shape you usually see Bengt himself smoking. It is light and comfortable to hold in the mouth and the walls are thick enough, so the pipe will not burn hot. It has all the credits of a well-functioning pipe. But Bengt likes challenges and even if he is sometimes hesitating, he can not avoid tackling them. The “Blowfish” is such a challenge. This shape was originally created by Lars Ivarsson, the son of the earlier mentioned Sixten Ivarsson. Lars got the idea when he was looking at a fish in his aquarium, a Blowfish. I do not know what such a fish looks like, but it became a thrilling pipe-shape. But it is probably one of the most difficult to make. First you have to find a suitable block, so that the grain will be horizontal on the plain parts and bird’s eyes on the sides. Not many blocks can match that. Because of the grain, the pipe has to be asymmetrical and there is the next problem. It must look good from every angel you look at it – and you have to make that without spoiling the grain. Not an easy task! 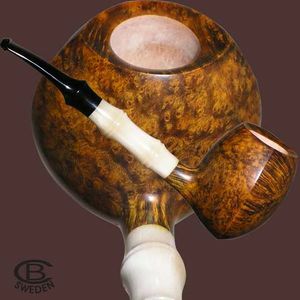 I have always been very fond of this shape and when I recently on my 60’s birthday got a Blowfish from Bengt, my happiness was complete. And I think the pipe I got, is the most beautiful Blowfish Bengt ever made. Of course I have to put a picture of this “dream-pipe” here. Every time I speak to Bengt about the Blowfish, he shakes his head and says: “I have so many times decided never to make a pipe in that shape again, but then I find a suitable block and suddenly I have started once more”. I am not alone to be grateful for this, many of his customers are constantly asking for a Blowfish signed BC Sweden. When this is written Bengt is eagerly working with bamboo and horn, two materials he has not been using before. So this is a new challenge. By the way, bamboo is very hard to find nowadays and has become very expensive. You can not use any bamboo, the annual rings have to be close. One of the first pipes with bamboo Bengt made is an “Elephant Foot” and you can see that pipe here. 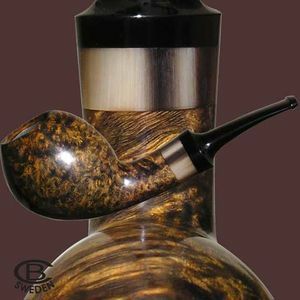 I have had the privilege to follow Bengt’s progress as a pipemaker from the start, step by step. Modern technology makes it easy to scan pipes and Bengt usually is sending me a picture of every new pipe he has made. It is always with excitement and great expectations I open these mails. Bengt is today sharing his time between looking after his grand-children, playing golf, taking care of the family’s summer-house, serving his wife Inga-Lill who is still working and – of course - making pipes. Sometimes I take him away from all these duties with a lot of articles and pictures and then he has to start making a new issue of Rökringar, the magazine for the Pipe Club of Sweden. I think the life as a retiree may be a little stressful sometimes, but it sounds like a really good life, no? 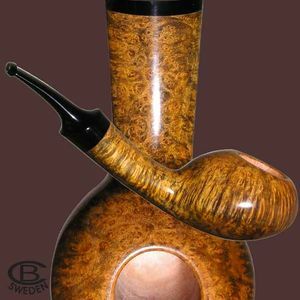 Bengt was entrusted with Bo Nordh's famously abused pipe to restore, and then replicated it in small quantity shortly after Bo's passing. This page was last edited on 22 September 2018, at 09:24.